This is what I like to call “auto-waste”, and it’s a policy of FAR too many businesses, organizations, and charities in the Western world. Basically it means that no matter how you sign up for something, for example entirely online, the entity you signed up with will automatically send you a bunch of wasteful paper mail you never wanted nor needed. 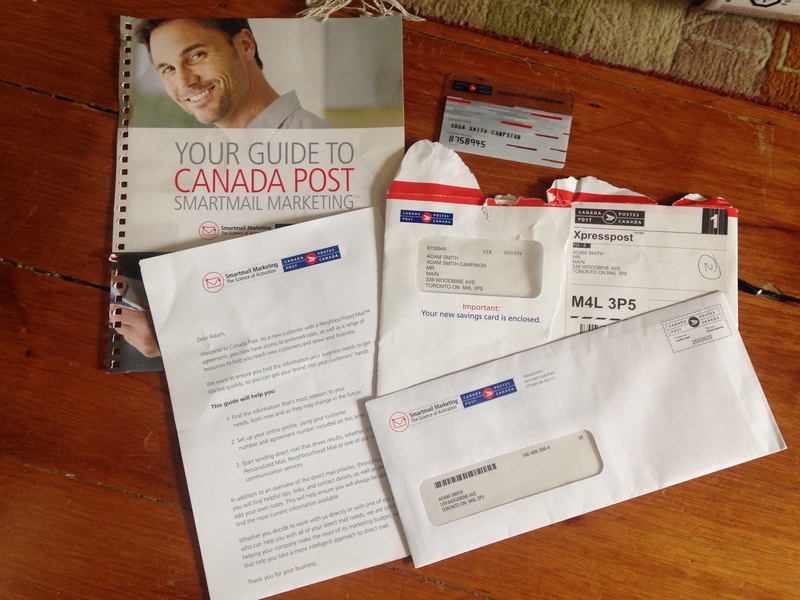 I used Canada Post direct mail service for my campaign to mail out flyers. The ENTIRE process was done online, and I never opted for any extra info or mailout. What I got a few weeks later AFTER THE CAMPAIGN WAS OVER was THREE separate mailouts, one expensive looking spiral bound booklet mailed in a bloody bubble envelope (most wasteful part), and TWO separate paper mailouts, one which contained a useless plastic membership card for a campaign that no longer exists (and the card isn’t even necessary, it’s just for show, you don’t need it for direct mail drop offs). I’m pretty livid they would do this without any consent on my part, the waste is staggering. Most ironic, it’s all explaining and detailing the process I’VE ALREADY BEEN THROUGH, so they’re telling me something I already know. I donate to the CNIB Ontario, and also recently received their pointless waste of paper newsletter, which I could easily read online, but more to the point, WHEN I SIGNED UP I MADE IT CLEAR I NEVER WANTED PAPER MAIL. Like ever, to the point the first time they mailed me I wrote to them and said don’t ever mail me again, clearly they didn’t get the message. Same issue with the Green Party of Ontario and Green Party of Canada – Parti vert du Canada, told them multiple times I would cease donating if they kept sending me unwanted paper mail, took them a couple years but it seems they may have finally got the hint. Worst of all however was when I first donated to a dubious charity a few years ago “Friends” of the CBC which is an offshoot of Friends of Canadian Broadcasting // Les Amis de la radiodiffusion. Well, some friend, they sold my name and address to a bunch of other charities and for almost three years I received numerous expensive mailings with unwanted swag (bags, stickers, keychains), many from charities and foundations I’ve never heard of nor would ever donate to. At one point I was going to start putting it all in a pile to make a complaint to show how many pounds of useless waste one donation had resulted in, but at that point the bulk of it had passed. Charities should not be allowed under law to sell your name to other charities, if I’d know that was legit I would have thought twice. The amount of mail I received over the next three years cost FAR more than my donation. It’s this kind of “auto-waste” our economy needs to ban, it’s based on unproven and obsolete assumptions about what will attract more business and money. The biggest irony is that I contacted ALL of these orgs via the internet, and yet ALL thought it necessary to send me wasteful paper. Why? Because it’s just something they do automatically without thought or question. Which is why I call it auto-waste and it needs to be banned. It’s an anachronism from a time before online, we have evolved, their policies need to as well. Any online donor that needs to feel special being mailed something physical in exchange for their donation doesn’t really get the point. Our planet has enough strain with the waste created from everyday life, we don’t need to add to it waste no one asked for or needs.